It started as a hospital built on the proceeds of rum and was eventually transformed into the building we now know as NSW Parliament. Events held at NSW Parliament were traditionally reserved for members of Parliament, visiting dignitaries, consulate representatives and members of the Royal family. Guests were referred to as “strangers”, creating the saying “where strangers become friends”. Today, the doors are open to all. 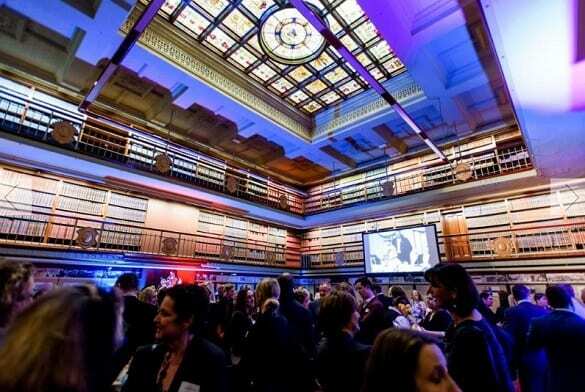 Located in the heart of the city within the historic precinct of Macquarie Street, this historic venue is full of hidden surprises across its nine event spaces, from beautiful garden views of the Domain, to heritage rooms dating back to 1816 and versatile contemporary spaces with the latest technology. The Strangers’ Room, NSW Parliament’s largest room, accommodates up-to 800 people for cocktails. This striking contemporary venue features floor-to-ceiling windows, panoramic views of the Domain, a built in PA system, four 60-inch plasma screens, a small stage, two wireless microphones and a lectern with microphone making it ideal for gala dinners, award nights, corporate lunches, conferencing and large cocktail receptions. This versatile venue can also be divided into three sections. NSW Parliament Catering is led by celebrated executive chef Vanessa Harcourt, who with her talented culinary team offer a menu curated to showcase a wide variety of premium seasonal food from locally sourced and sustainable suppliers – Central Coast figs and finger limes, Clarence River prawns and Leppington burrata [cow’s milk cheese] make regular appearances. This sentiment continues through to today, with NSW Parliament inviting you and your guests to continue this tradition and make new friends at your next event.